I’m not sure i f today’s post will inspire you…but I think you may smile while you are browsing through the 16 selections. When I see designs like this it helps me abandon my fears and say “WHAT THE HECK”…LET’S SEE WHAT HAPPENS!!! Thank you to Dee Wilder for this ‘thought’ provoking link. I’m surprised we didn’t see “lobster shoes” among these selections! 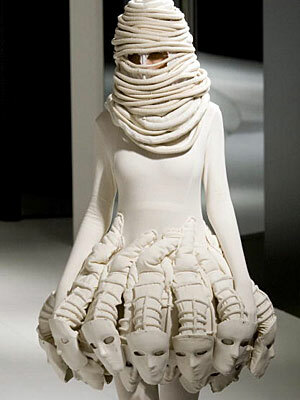 Maybe it was out of respect for Alexander McQueen! I did see a runway show where several of the models fell…and they weren’t even in lobster shoes. I love this link…it is sooooooooooooooo freeing!! !